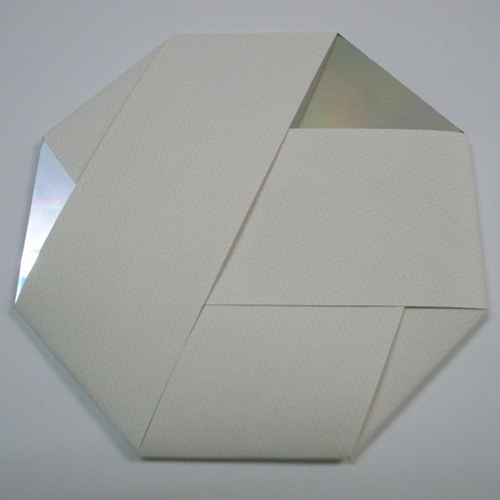 SOISONG octagonal CDEP, tour 2008 limited edtion, introducing "disposable design" package line. The title of the record сan be used as a password to access one of the areas in the band's website containing additional artwork for the release and further information on its contents. Up until this CD, SoiSong have been a shadowy presence, marked by rare concerts in Asia, special editions limited to one copy and password-protected Web sites. This confoundingly designed and packaged EP is the first above ground broadcast from the duo and, musically, things are as shadowy as their real life and online presence. Like any good collaboration between established artists, it is this combination of the familiar and unfamiliar that gives SoiSong part of its appeal. Amid the familiar tones that Pavlov and Christopherson wrench from their machines, other less recognizable elements emerge through the mix. The opening piece, “Kabuki-Chop,” is the one piece where the music’s heritage is most obvious. There is a slow build up where echoes of Musick to Play in the Dark and Pavlov’s more recent releases combine to make a narcotic buzz before the music explodes in a throbbing beat ridden climax. As good as “Kabuki-Chop” is, it is from “Soijin No Hi” onwards that the EP demonstrates what SoiSong are capable of. Many of the tracks have a music box quality about them; delicate piano refrains and bell-like sounds prove to be fragile as they are ripped apart in glitchy explosions. Grit, grain and lurching beats are infrequent but welcome additions to pieces that sometimes veer a shade too close to being airy-fairy new age for comfort. The title of this EP is only known to those who own the CD [or those who search about online] as the title is a password that gives access to a private section of the SoiSong website. Within the password protected part of the site are different edits of the pieces [shorter than the CD versions], the track titles and artwork for each track. The different artworks for the pieces are not my cup of tea [aside from a painting by Brion Gysin which is nice but not mindblowing] but the physical packaging of the EP and the disc itself are both worth mentioning. The CD is octagonal so will not play on car stereos, Macs or any non-standard tray player [despite Christopherson’s long interest in Apple products]. It arrives in a white criss-cross paper sleeve that completely seals in the CD. To open it, the packaging must be damaged, which goes against every rabid collector’s instincts. There is a way of opening it without doing too much damage [use a sharp knife to break the glue seal on one of the tucked in strips] but even doing it this way lead to some unsightly rips on my copy. Needless to say, folding it back up is a challenge. One thing that was a bit of a kicker with this release was the price tag: £20 for an EP in “disposable packaging” might be putting some people off but considering how the pound sterling is bottoming out and how good the music is, my one recommendation is to raise a middle finger to the recession and indulge in this. On less frivolous terms, this EP is a taster for the forthcoming SoiSong album and considering Christopherson’s comments at Brainwaves, the album is going to be something special. In the meantime, this EP certainly has enough depth to keep me going until the album comes out. The four pieces are a solid introduction to this new collaborative project, the spark of a fresh working relationship is bright here and with any luck will only get brighter. This is it, ladies and gentlemen. The eclectic, experimental duo to measure all others against. Synthetic shamen, if you will. Cabalists of an arcane, occult undercurrent. Peter Christopherson is a name no one should not know. He's a founding member of Throbbing Gristle, he also just last year put out the triumph which is The Threshold House Boys Choir. His alchemic abilities I think personally contributed more than anything else to the genius which was Coil. I now have the pleasure of introducing his new project SoiSong, which he has undertaken with another gentleman few know and even fewer listen to: Ivan Pavlov aka COH. A mind-bending genre-rending project, COH runs one's perceptions and conceptions to the boards. Absolutely visceral work I only wish more would aspire to. He can make hours drift by effortlessly with his albums, his compositions break down the barrier between the conscious and the void with sparse abandon. Now in 2008, these two visionary artists have at last collaborated on an EP which will be the subject of conjecture and controversy for years to come. This one has drawn some notice from the public due to it's highly original packaging and insanely limited issue. Like Coil, SoiSong have their detractors, those who show their truest colours by virtue of their unwillingness to embrace this sigil for what it is: an artifact of immense sonic potency. There is detail the likes of which have not heretofore shown themselves in the tapestry of work such as the fourth track "Koi Ru" which despite its hushed and restrained opening via a simple carrier tone builds magnificently to heights Babel surely would have had it not been for the "assistance" of a jealous deity. These are not songs, they are portraits, self-styled dissonant time-sensitive signatures for the future. Somehow the thirty six plus minutes fly by and there is a lingering need to hear more, so it gets played again. And again. And again. Beguilingly seductive, SoiSong caress and kill, they cure and they curse.